Because the Renovaré Book Club and Goodreads is studying my book Madame Guyon Her Autobiography, I’ve been rereading it. I’ve been particularly impressed by Jeanne Guyon’s peace and tranquility in the face of so much persecution. She was lied about, so much so that her older son and many others were turned against her. Certain people, mostly religious leaders, schemed to get her inheritance and to gain custody of her children for their own gain. One group tried to get her 12 year old daughter to marry a . . .well, “dirty old man,” shall we say? . . . so that it would profit them. Such injustice, especially by Christians, really upsets me. How can they do that??? But Jeanne Guyon did not respond that way. Instead: “I was plunged into a river of peace” (p. 75)! What? And I have been surprised and even puzzled that she lived in such joy: “I had unspeakable joy and freedom in my rigorous captivity. I was and am tranquil in the midst of a furious tempest which assaults me on every side” (p. 134). Yet this didn’t mean she was a wimp. She answered her accusers skillfully and then turned back to helping the people around her. I would love to be like that! For a few days, I despaired that although I’ve made progress in moving away from crabbiness into contentment and joy, I do not have the peace and joy she had. Finally in my 4th reading of the book, I was struck by her identifying with this quotation from Jesus: “It is written of me to do Thy will, O God” (Heb. 10:7). (Jesus seems to have been quoting Psalm 40:6-8: “I delight to do your will, O my God.) A paraphrase might be: I love doing what you say, God! As I thought about it, I realized that Madame Guyon wasn’t seeking peace and joy. She was seeking and even seemed delighted to do God’s will in each moment. Her peace and joy came, I think, because of her focus of attention wasn’t on gaining peace and joy, but on being the person God intended. I immediately recognized its similarity to Step 11 of the 12 steps: “praying only for knowledge of His will for us and the power to carry it out.” So perhaps I was seeking the wrong thing. I was seeking the result, but skipping the process. What a relief! To me, God’s will is not complicated. It’s a moment by moment activity right now. It can be simplified and summarized by the 3 invitations/commands that precede this phrase: “for this is the will of God for you in Christ Jesus.” What might that be? Beyond that, we know God’s will based on our daily conversations with God in prayer and Scripture reading. God seems to speak in themes (if we’re attentive) and these are usually what we need to know and do. Lately, in my mornings of lectio divina, I’ve been hearing: forgive a certain person; let go of the desire to be noticed or important; love whomever is standing in front of me; bless whomever emails me; eat healthfully not self-indulgently. So I’m no longer in despair about not being as peaceful and joyful as I’d like. I’ll focus on what God is inviting me into today and let God take care of the results. 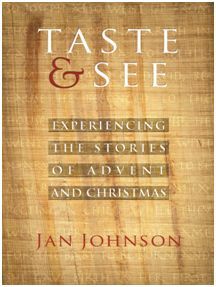 Oct 16-31 Patheos Book Club is studying my advent Guide, Taste and See. Why now? Enter into the events yourself through the guided study-meditations and then invite a group to join you for Advent. Or use it to prepare now for the Christmas devotion you’ve been asked to give. Several very different cultural details are included that might surprise you. If you wish to comment, please do so on theConversations blog.